The involvement of Iraqi fighters on the government side in the Syrian civil war first became widely known in early 2013. The main formation under which these fighters initially operated was Liwa Abu al-Fadl al-Abbas. Subsequently in 2013, new Iraqi-led formations emerged, among them the Rapid Intervention Regiment, led by one Ahmad al-Hajji al-Sa'adi. For purposes of the historical record, I conducted an interview today with al-Sa'adi regarding his life and involvement in the fighting in Syria. As always, any parenthetical insertions in square brackets are my own. Q: Where were you born and from which province are you? Did you resist the evil American occupation in our land? Were you in Jaysh al-Mahdi for example? A: I was born in 1988 in Baghdad province. Yes, I resisted the American occupation for 5 years and I was the first of those rebelling [against it] in Jaysh al-Imam al-Mahdi (ع). Q: In what year did you migrate to Syria and for what reasons did you migrate? A: I migrated to Syria at the beginning of 2009 approximately after I was arrested by the American occupation forces. I migrated for one reason: that is, fear for my family at the hands of the occupation, as my photos spread in the streets of Baghdad and the occupation carried out daily search raids on my family. Q: Yes. For how many days were you in the prisons of the evil occupation? A: Around 10-15 days. I got out in a prisoners swap deal. Q: How was life in Syria before the war? A: Syria was blessed with security, praise be to God, and it was the warm embrace for every noble Arab resister. Q: And with the beginning of the events in Syria, when did you bear arms for the first time and within which formation were you? Were you originally in Liwa Abu al-Fadl al-Abbas? A: The first time I bore arms was at the beginning of the crisis in the area of Sayyida Zainab (peace be upon her) and we were within the formation of the brigade [Liwa Abu al-Fadl al-Abbas] because we were the founders of it: the martyr commander Ahmad Kayara and I.
Q: And when did you form the Rapid Intervention Regiment exactly? And why did you leave Liwa Abu al-Fadl al-Abbas? A: We formed the Rapid Intervention Regiment after I was wounded and the martyrdom of the commander Ahmad Kayara. The mujahideen brothers and I who were in the Liwa Abu al-Fadl formation [set up the Rapid Intervention Regiment]. 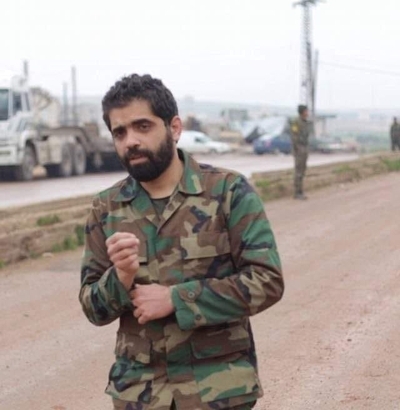 I left the brigade [Liwa Abu al-Fadl al-Abbas] to preserve my jihadi work. Q: In which battles did the regiment participate? And how many martyrs did it offer? Did the brothers from the Islamic Resistance- Hezbollah and the Iranian friends help you in matters of arming and training etc.? A: The regiment participated most operations of the periphery of Sayyida Zainab (ع) and its environs. One martyr and a large number of wounded. We do not need training as we had tasted the woes of the American occupation. And yes, our arms were from Hezbollah. And most of the operations were coordinated between us and the brothers in Hezbollah. Q: Did they help you financially as well? Q: Of course the terrorist Da'esh [Islamic State] seized wide areas of our land in 2014. You returned to Iraq for a short period and participated in operations within the ranks of Saraya al-Salam [Muqtada al-Sadr's group] right? A: Correct. I returned for a short time to Iraq and participated in the Samarra' operations with the brothers in Saraya al-Salam, because I had pledged to myself that if any pure area of the land should fall, then God willing I should be the first to join the convoy of the mujahideen. Q: Yes. And later you returned to Syria and received the leadership of the regiment a second time? A: I did not leave the regiment. A few of the mujahideen of the regiment remained in Syria for emergencies and the rest of the mujahideen joined with me to participate in the Samarra' operations. Q: After your return to Syria in which operations did you participate? For example in Busra al-Sham and al-Zabadani? And in the end when was the regiment dissolved and for what reasons? A: Yes, I only participated in the Busra al-Sham operations because the people in Busra al-Sham appealed to us. And the regiment remains active until this day of ours if any emergency requires it. Q: But currently the work is suspended? A: Yes, suspended currently because of the return of security to the Sayyida Zainab area. If any emergency should arise (God forbid), the mujahideen of the regiment will be most ready. Q: And with the suspension of the regiment's work you have joined Kata'ib al-Imam Ali (ع)? And are you still with the Kata'ib till this day of ours? A: I did not join but rather the brothers in each resistance faction adopted one of the original Liwa Abu al-Fadl mujahideen and my work with Kata'ib al-Imam [Ali] is on a civilian level, not a military one. Q: So every mujahid from the Intervention Regiment has gone to work with one of the resistance factions. A: Not the mujahideen of the regiment, but rather the original mujahideen of Liwa Abu al-Fadl. Q: What is your role in Kata'ib al-Imam Ali exactly? A: Martyrs and wounded official: and I chose this civilian work so my connection on a military level should only with Zaynab (ع). Q: I saw that you have met with officials from the Syrian state. Will the Syrian state give Syrian nationality to the Iraqi mujahideen in Syria in recognition of their sacrifices in defending Syria? Or is it possible the Syrian state will facilitate the visits of the Iraqis to Syria? A: I met [them] as I occupy the position of relations official in the Kata'ib as well. I personally have not asked for nationality but were I to ask for Syrian nationality for any resister, I believe that it will be given. And facilitations of the visits of the Iraqis to Syria has been going on from before the crisis until now. Q: In any case the Iraqis in Syria do not want Syrian nationality? And they have not demanded this thing until now? Q: Is your marja'iya [religious authority] Sadrist? A: Of course. I raise my head that I am of the followers of the noble al-Sadr family. Q: How do you assess the situation in Syria today? Has the resistance truly been victorious? A: The situation in Syria is very good. Of course the resistance declared its victory and it is victorious by the support of God (Almighty and Exalted is He) and what we see today on the ground of reality is the greatest evidence: and that is the madness of Trump and his ally Israel after they lost all their means of leverage in the region and began raising the issue of the occupied Golan. Q: Would you like to return to Iraq to live or do you prefer to remain in Syria? A: Syria and Iraq are both the warm homeland for me.